Spend less time setting up your gear and more time enjoying it. 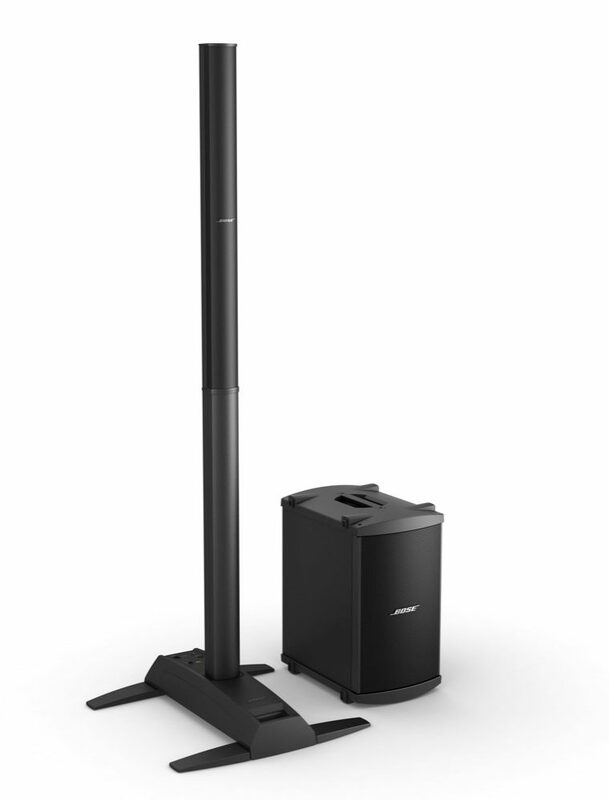 The Bose L1 Model 1S Single B2 bass system delivers a potent combination of portability and performance. It's compact and light enough to make setup quick and easy, yet powerful enough to fill a mid-sized venue. Includes one B2 bass module for more flexibility and even greater power at the low end. The vertical configuration of the system's small, closely spaced drivers allows the L1 Model 1S system to project sound forward and to the sides -- delivering 180-degree coverage -- but very little up and down, reducing unwanted reverberation. This produces consistent tonal balance as sound spreads more evenly across the stage and into the audience, and the volume level drops off much more slowly than with a conventional speaker. Unique Bose(R) technologies enable the system to serve as both PA and monitor. It can be positioned behind or to the side of the performer -- and you hear just what the audience hears. You're in control, and there's no need for conventional monitors, mixers and PA systems. Spatial Dispersion and Articulated Array speaker technologies in the loudspeaker produce wide, uniform sound coverage. The 12 small drivers are arranged using Articulated Array speaker technology in a slim, vertical enclosure -- creating nearly 180 degrees of horizontal coverage and consistent tonal balance. The three components of the L1 Model 1S system -- upper array, lower extension and power stand -- connect quickly and easily without the need for separate speaker stands. Setup and breakdown take just minutes. And everything stores neatly into the included carry bags, making transport easy, too. The B2 bass module's highly efficient speaker design features two 10" (13.3 cm), high-output, high-excursion drivers that produce deep, strong bass from a small enclosure. Three level settings provide flexibility of output. When connected to your L1 system's power stand, active equalization circuitry automatically adjusts bass signal appropriately. The compact enclosure is easy to transport, set up and break down, with a small footprint that takes up considerably less space than traditional bass cabs required for same performance. Interlocking end caps let you securely stack two modules together on their sides. The high-performance B2 bass module includes three settings for increased flexibility. The normal setting is ideal for bass guitar or when miking a kick drum. A higher setting is designed for DJ/music playback applications. And the lower setting works well for acoustic guitar and vocals. Add an optional Bose ToneMatch mixer to expand the system with more input channels and connect additional instruments and microphones. ToneMatch mixers also give you powerful, proprietary tone-shaping tools to fine-tune your sound. - ToneMatch(R) port on power stand for digital audio and power connection to optional ToneMatch T4S mixer. - Analog input, trim control and signal/clip LED for line-level analog input via 1/4" TRS cable. Can be used for instruments or other audio sources like DJ mixers, MP3 players, computers or DVD systems. - Bass module out for amplified bass output signal to one or two B1 bass modules or one B2 bass module. L1 system automatically adjusts equalization appropriately when bass modules are connected. - Interlocking design of the four lightweight components eliminates the need for speaker stands and speaker wires. Setup takes only minutes. - Four retractable legs fold out of power stand simultaneously for quick setup and compact transport. - Convenient carry bags -- one each for the loudspeaker, power stand and bass module -- make getting to and from your gig that much easier. Overall: I've been a DJ for about 15 years now...and the sounds are the heart of the performance as far as I am concerned. People always think the lights are what matters, or the hardware like turntables that make the DJ show amazing. I'm here to tell you, it's the sounds! 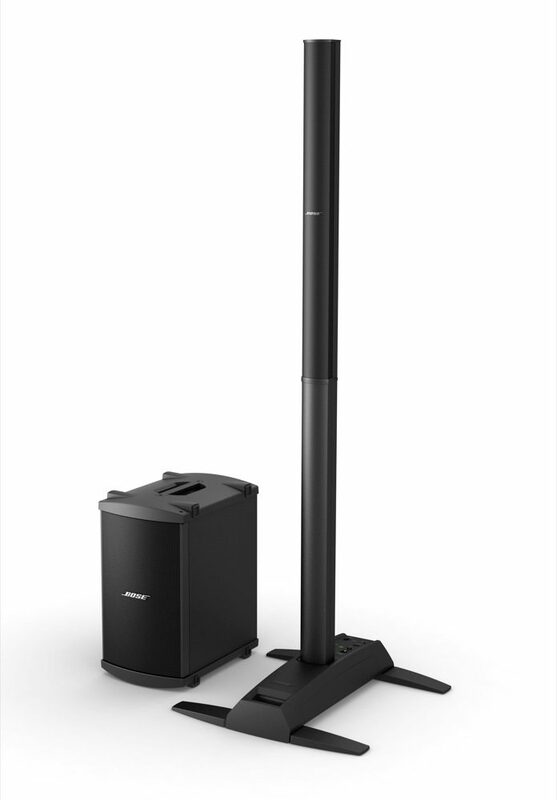 This Bose product is the best speaker system I have ever purchased. From going from heavy 15" speakers to these is a huge change. They are so compact, easy to transport and loud as hell. They connect to almost anything as long as it has a 1/4" plug. I just had to get another one! I have a small Honda Civic, and I fit 2 of these systems comfortably. Every gig I get amazes people. "Is all that sound coming from that speaker? ", they ask. And I answer with a big smile and say, "YES!" I LOVE IT!! 25 of 25 people (100%) found this review helpful. Did you? "Bose L1 1S with B2 Bass Module"
Overall: For a number of years, I've been thinking about getting a Bose system. Because they are rather rare where I live, it's been difficult to get my hands (and ears) on one. I was able to listen to one at a local big box music retailer for just a few minutes and had the opportunity to work a mixer for a bit. That was a few months ago.So, in my email, a message from Zzounds comes along offering the 12 payment plan. Without hesitation, I decide to order a L1 1S with B2 Bass Module. Now, in the back of my mind my spider-sense was tingling... will it sound as good as I hope it will? Will my concerns about the "punch" and "highs/lows" be resolved? Well, the unit arrived quickly and a few days later I had the opportunity to try it out for a holiday party with karaoke.I have to say that I was literally blown away by the sound and quality of this set up! The venue was mid-sized and the throw was great. People in the back of the room could hear everything. While the karaoke singers were on stage, they could hear themselves without the need for a separate monitor and when I needed to kick up the volume for DJ music, the B2 sub gave me the kick I needed to get people dancing. The best part was the bar owner's expression when he saw what was providing all of that sound!The next week, I had another holiday party, this time with live music. Besides being a DJ, I perform as a one-man act with keys, horns and sing. This venue was larger and had about 150 people. Well, the Bose killed it!During this event, they needed to speak to the audience for about a half hour and the podium was on the other side of the room (about 75 feet away) Not once did anyone look at me with that "I can't hear him look..."While I still need to use this at a smaller weeding, I felt confident enough in what I've heard so far to write this review. If it keeps amazing me with it's versatility and sound quality, I'll be buying another identical set up next season.